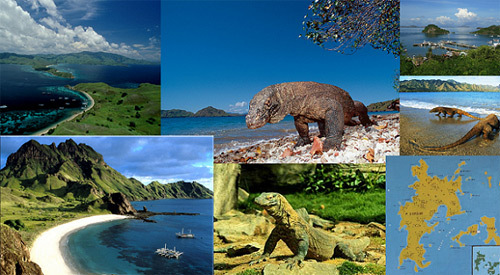 A small island of 280 square km, Komodo is located between Sumbawa and Flores islands. It is famous for its giant lizards, considered the last of their kind remaining in the world today, the Komodo dragon. Called “ora” by the local people, Komodo “Dragon” (Varanus Komodoensis) is actually a giant monitor lizard. Growing up to 3 to 4 meters in length, its ancestors roamed the earth up to about half a million years ago. Komodo live on goats, deer, and even the carcasses of its own kind. The only human population on the island is at the fishing village called Komodo who supplement their income-breeding goats, which are used to feed the lizards. The Komodo had protected by the law and although they are considered harmless, it is advisable to keep them at a distance. Komodo Island is now a nature reserve, home to a number of rare bird species, deer, and wild pigs, which are prey to the lizards as well.